A rail car to safety. Evacuation systems have been built into launch pads sincethe 1960's Saturn rockets took astronauts to the moon. Earlier systemsconsisted of a cablebasket that would take evacuated astronauts to the ground. The re-engineered Launch Complex 39B will need to handle thenew Orionspacecraft and its Ares 1 rocket. For quick evac,NASA turned to the world's rollercoaster designers for help. In the event of an emergency, astronauts will jump into tramcars and head face down toward the ground (see illustration) from a height ofapproximately 370 feet. "Technologydeveloped for the public thrill-seekers is very applicable here," saysScott Horowitz, head of NASA's effort to return to the moon. Once completed in 2012, the NASA 'coaster will be theworld's third tallest, after the Kingda Ka at SixFlags Great Adventure in Jackson, New Jersey, and the Top Thrill Dragster atCedar Point in Sandusky, Ohio. Attention NASA engineers: check out the RoboCoaster G2 - Extreme Robot Roller Coaster for ideasfor extra thrills on the way down. People who don't meet NASA's height requirement (not to mention being an astronaut) can still enjoy the Shuttle Launch Experience at the Kennedy Space Center. 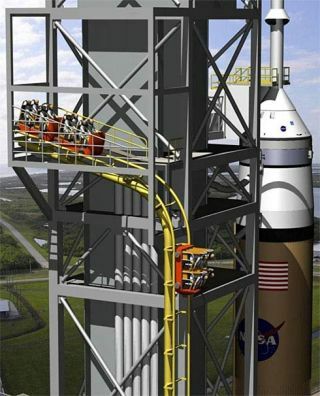 Via NASA: Astronauts to Ride Rails in Emergency and NASA designs a 'roller coaster' escape.